Can Pakistan Regain Control of Swat from the Taliban? "Smile, you're in Swat," reads a billboard on the main road into the lush green honeymooners' valley in Pakistan once dubbed the "Switzerland of Asia." But over the past two years, Swat has been turned into a playground for the Taliban. And it may be the Taliban and their fellow Islamists who have the biggest reason to smile as a result of the Pakistani government's decision last week to end its floundering military campaign there and instead accept the Taliban's demand for the imposition of Islamic Shari'a law. The lynchpin of the government's effort to defuse the Taliban insurgency is Sufi Mohammed, a septuagenarian Islamist cleric whose Movement for the Enforcement of Islamic Law has returned to Swat with the backing of the authorities. "We will ask them to lay down their weapons," Mohammed says of the local Taliban. "We are hopeful that they won't turn us down." Mohammed's credibility with the militants is based on the fact that he waged his own violent campaign for Shari'a law in the area in the mid-1990s; he also fought alongside the Taliban when U.S. forces invaded in 2001. Even though he has renounced violence, Mohammed still denounces democracy as a "heresy." Now he must convince the man who has stolen his thunder  Maulana Fazlullah, whose forces control 80% of the area after a fierce two-year conflict with the Pakistani army that cost more than 1,500 lives  to lay down arms. Fazlullah is an erstwhile disciple of Mohammed as well as his estranged son-in-law. 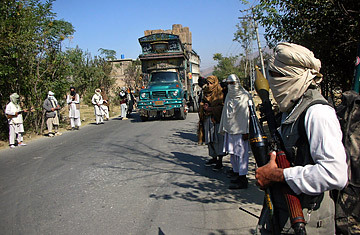 With the military effort failing to stem the Taliban's advance in an area just over three hours from the capital, the government may have seen Mohammed as a lesser evil, accepting his demand for Shari'a law in order to help Mohammed win back control of Swat from the Taliban. The local Taliban, of course, have already effectively imposed their own version of Shari'a on the area. Until a few months ago, the Cheena market in Mingora thronged with women buying dresses and jewelery; now it is closed. Stores selling music and films have been attacked, and though barbers still offer haircuts, they will no longer shave a customer, after the Taliban forbade it. Mohammed's return to the area has already brought visible changes. "It's the first time in nearly two years I'm seeing police in uniform out on the streets and in their cars," says laborer Tahir Ali. "They used to be without uniform, sometimes too busy protecting themselves to protect the rest of us." The Taliban has destroyed more than 180 schools across the valley, mostly girls' schools but a number of boys schools too. Now government schools are expected to reopen in March, after the winter break. Government officials insist that under Mohammed's Shari'a regulations, the Taliban's prohibition on female education will be lifted. But many of the teachers who were threatened have fled the area and are too fearful to return anytime soon. "The Taliban have threatened us not to come back," says Zunaiba Hayat, a 35-year-old middle-school teacher who moved to Islamabad after her school was ransacked by the militants.